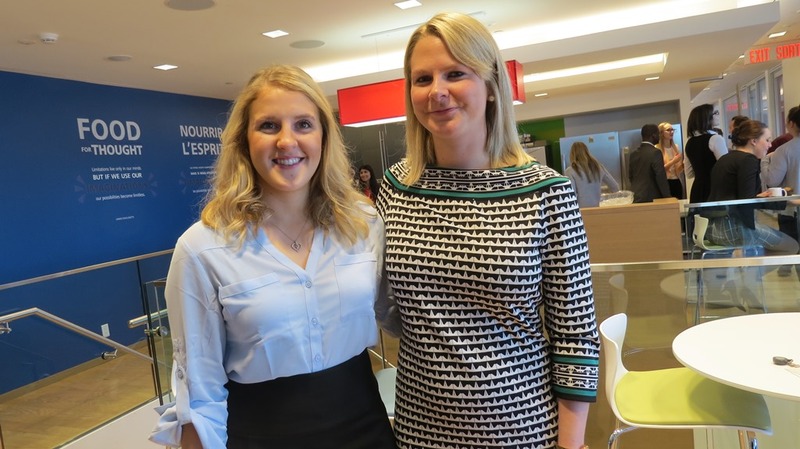 Robyn Smith (pictured left), accounting student, and Erica Newman, recruitment specialist at Deloitte. This winter, the University of Ottawa's Co-operative Education Programs achieved the milestone of its 40,000th placement in 35 years. After dropping a few hints on social media, the details of the 40,000th placement were unveiled in a ceremony at Deloitte's office in downtown Ottawa. To mark the occasion, a plaque was awarded to Robyn Smith, an accounting student at the Telfer School of Management, and Erica Newman, a recruitment specialist with Deloitte. "I'm proud to work at Deloitte and surprised to be the 40,000th placement. If I had any advice to give to students, it would be to get involved early in their time at university. Not just to stand out from others, but to create opportunities and gain the confidence they need to approach leaders like Deloitte," says Robyn Smith. “For the CO-OP program, the 40,000th placement is a significant accomplishment. However, behind this large number are 39,999 other experiences that are just as significant,” says Gaby St-Pierre, director of CO-OP and the Career Development Centre at the University of Ottawa. “Thanks to CO-OP, students eager to learn both theory and practice have had impressive careers all around the world. Since the program began in 1980, hundreds of employers acting as mentors have dedicated over 20 million hours to train the next generation and pass on their knowledge,” adds St-Pierre. In short, CO-OP is partnership between the University, students and employers. It’s a real example of intergenerational communication and assistance, of knowledge management and transfer. Most of all, it’s about over 40,000 experiences that have made a difference. Deloitte has partnered with the University of Ottawa for more than 30 years. It has offered nearly 200 CO-OP placements over the past 15 years. It has hired 10% of accounting students for winter 2016. It offers CO-OP placements and jobs for new graduates of various programs in many Canadian cities.